Polyester radial roller-furling sails with vertical battens in both the main and genoa. Radial sails made with polyester laminates are a good choice for cruising sailors who desire durability, yet who still appreciate the performance of sails that hold their shape better than traditional cross-cut Dacron sails. 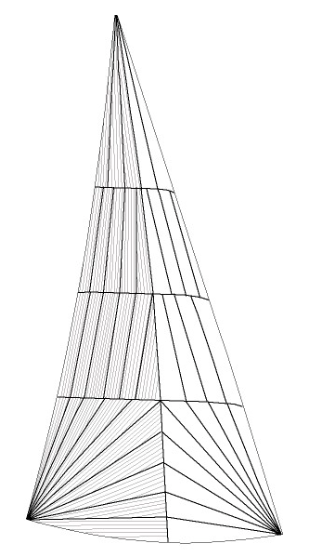 Radially panelled sails use "warp-oriented" cloth where the strongest yarns run the length of the narrow panels as shown by the thin grey lines. For clarity, the diagram only shows thread lines of the panels in the back half of this sail. The polyester yarns used in radial sails have much more strength in the warp direction. In order to more precisely match the warp-oriented cloth with the loads in the sail, (the triangular panels) need to be very narrow. This allows UK Sailmakers to use a lighter weight cloth with the same strength. Radial sails (with their many panels) allow sailmakers to use more than one laminated fabric in a sail. Stronger laminates can be used in high-load areas like the leech and tack, while lighter cloth can be used in the less-loaded luff of the sail. A third fabric, one that is heavy-duty and chafe-resistant, can be used in the foot panels to stand up to the abuses of tacking and chafing on the life lines. By mixing cloth types, sailmakers can make a lighter sail that has more strength where needed. Cruising laminates come with one or both sides covered with finely woven polyester taffeta, which improves chafe resistance.